An Act to provide assistance in combating mental retardation through grants for construction of research centers and grants for facilities for the mentally retarded and assistance in improving mental health through grants for construction of community mental health centers, and for other purposes. In 1955, Congress passed the Mental Health Study Act, leading to the establishment of the Joint Commission on Mental Illness and Mental Health. That Commission issued a report in 1961, which would become the basis of the 1963 Act. Only half of the proposed centers were ever built; none were fully funded, and the act didn’t provide money to operate them long-term. Some states saw an opportunity to close expensive state hospitals without spending some of the money on community-based care. Deinstitutionalization accelerated after the adoption of Medicaid in 1965. During the Reagan administration, the remaining funding for the act was converted into a mental-health block grant for states. Since the CMHA was enacted, 90 percent of beds have been cut at state hospitals. The CMHA proved to be a mixed success. Many patients, formerly warehoused in institutions, were released into the community. However, not all communities had the facilities or expertise to deal with them. In many cases, patients wound up in adult homes or with their families, or homeless in large cities, but without the mental health care they needed. 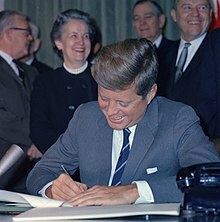 ^ Kennedy, John F. (31 October 1963). Remarks on signing mental retardation facilities and community health centers construction bill (Speech). Signing S. 1576, the Community Mental Health Act of 1963. White House Cabinet Room, Washington, DC: John F. Kennedy Presidential Library and Museum. JFKPOF-047-045. ^ a b Friedman, Michael B. (8 April 2004) . "Think About the Next 25 Years: Advice for the President's Commission on Mental Health". NAMI SCC. National Alliance for the Mentally Ill Santa Cruz County. Archived from the original on 2008-05-09. ^ "History of the Organization and the Movement". Mental Health America. Archived from the original on 2008-10-30. ^ Smith, Michelle R. (20 October 2013). "50 years later, Kennedy's vision for mental health not realized". The Seattle Times. The Associated Press. Archived from the original on 2013-10-23. ^ "History of Public Mental Health in California and the U.S." Center for Mental Health Services Research. The University of California, Berkeley and San Francisco. Archived from the original on 2007-05-25. ^ Rubin, Lillian B. (Fall 2007). "Sand Castles and Snake Pits: Homelessness, Public Policy, and the Law of Unintended Consequences". Dissent. ^ Friedman, Michael B. "Keeping The Promise of Community Mental Health". Mental Health Association of Westchester. Archived from the original on 2004-06-23. Retrieved 8 August 2003. Arce, A. Anthony; Vergare, Michael J. (December 1987). "Homelessness, the chronic mentally ill and community mental health centers". Community Mental Health Journal. Netherlands: Springer. 23 (4): 242–249. PMID 3440376. Institute of Medicine; Committee on Health Care for Homeless People (1988). Homelessness, Health, and Human Needs: Health Care and Human Needs. Washington, DC: National Academies Press. p. 97. doi:10.17226/1092. ISBN 978-0-309-03832-4. Rochefort, David A. (1993). From Poorhouses to Homelessness: Policy Analysis and Mental Health Care. Westport, CT: Auburn House. OCLC 27768141. Rudin, Edward; McInnes, Robert S. (July 1963). "Community Mental Health Services Act: Five Years of Operation Under the California Law". California Medicine. 99 (1): 9–11. PMC 1515154. PMID 13982995. Sharfstein, Steven S. (May 2000). "Whatever Happened to Community Mental Health?". Psychiatric Services. American Psychiatric Association. 51 (5): 616–620. doi:10.1176/appi.ps.51.5.616. PMID 10783179. Stavis, Paul F. (April 1991). "Homeward Bound: The Developing Legal Right to a Home in the Community". Quality of Care Newsletter. New York State Commission on Quality of Care and Advocacy for Persons with Disabilities (48). Archived from the original on 2009-01-11. "S. 1576 (88th): An Act to provide assistance in combating mental retardation through grants for construction of research centers and grants for facilities for the mentally retarded and assistance in improving mental health through grants for construction and initial staffing". GovTrack. Civic Impulse, LLC.